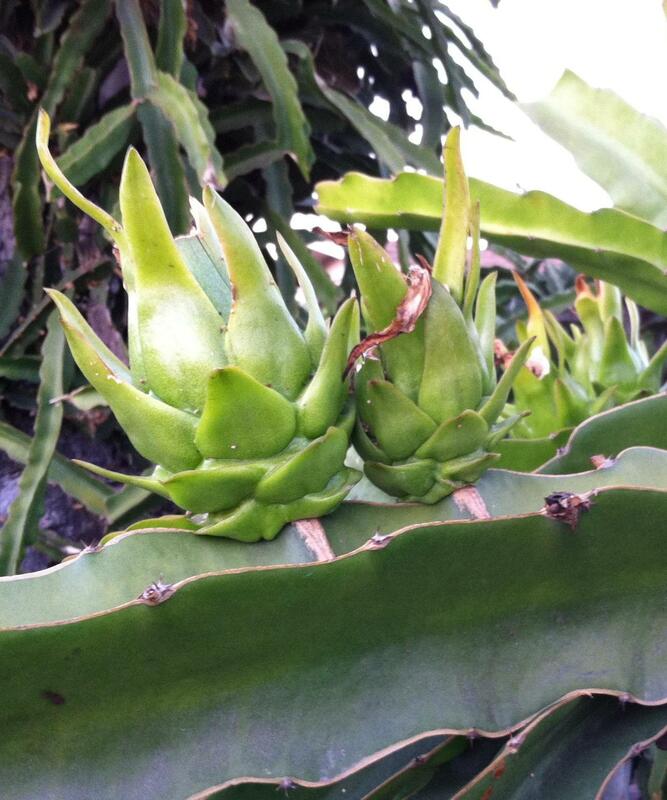 History: Dragon fruit is also known by its less common names, Pitahaya. The Chinese commonly call it huǒ lóng guǒ, which directly translates to fire dragon fruit. 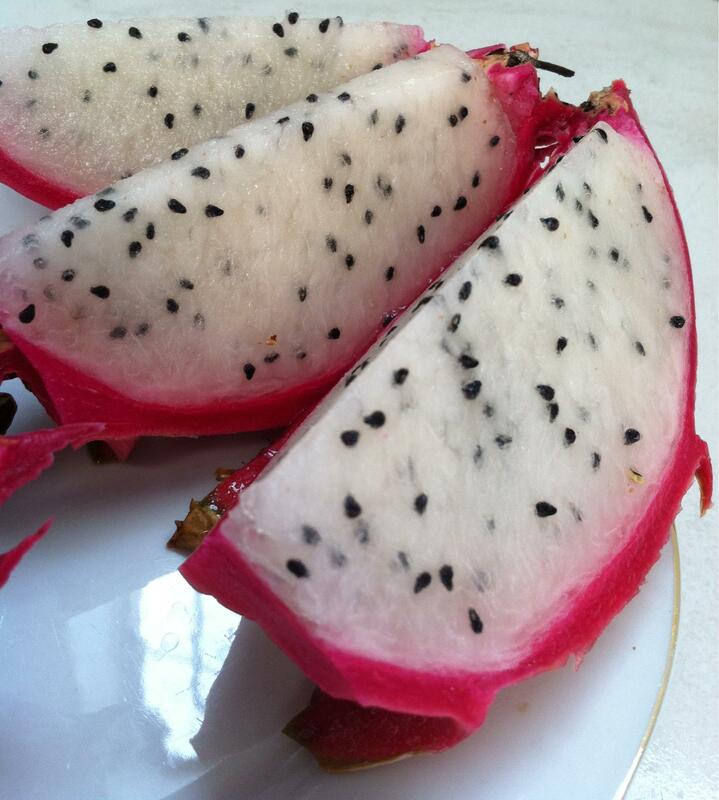 The scientific name for the white fleshed dragonfruit is Hylocereus undatus. This can be attributed to the way it looks when placed vertically. The fruit appears to have green flames coming up. It is actually part of the cactus family and its popularity arises from Southeast Asia, Vietnam being the primary producer. Interestingly enough, the origin of the dragon fruit is far removed from its popularity, and the Pitahaya is native to central america. It has been rumored that the fruit was brought over to Vietnam by the French; now the Vietnamese and Mexican cultivate it for its. 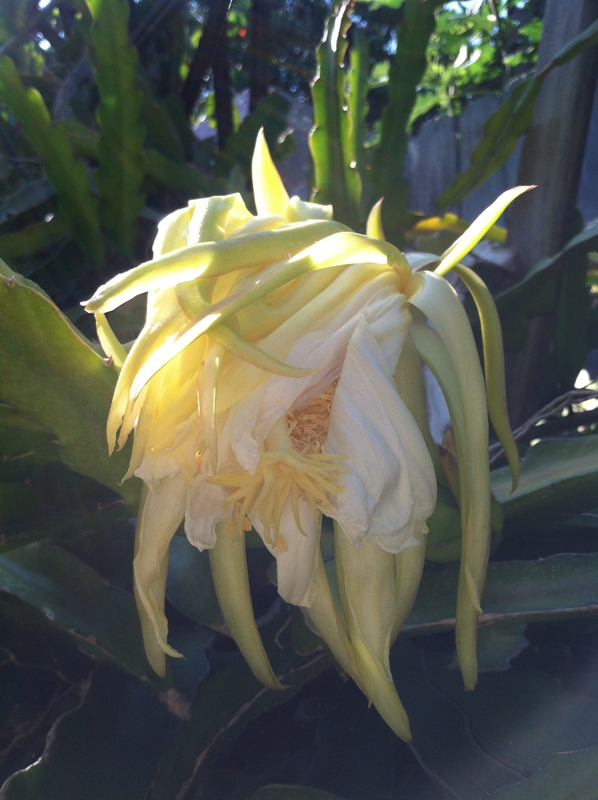 The Pitahaya only blooms at night and wilts by morning. This process repeats itself as the fruit beings to form. More recently, the dragon fruit has become more popular in the states, being carried at more grocers. 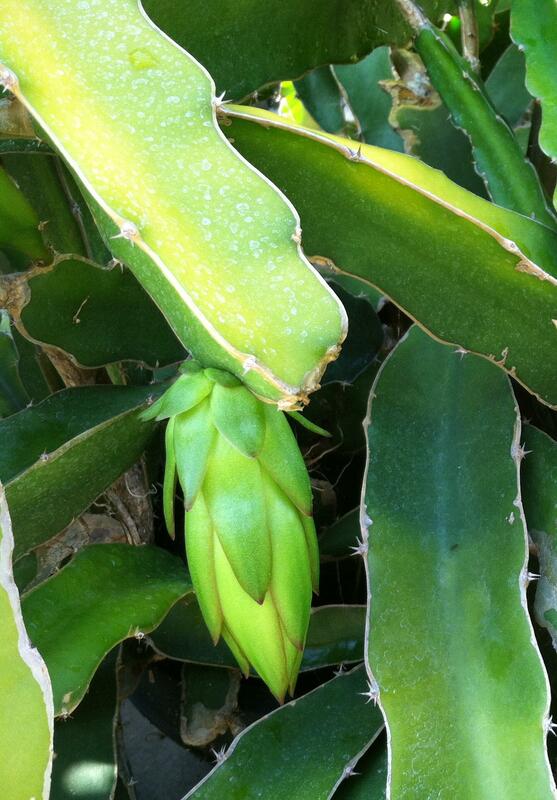 This is the dragon fruit when the flowers are still developing from the buds. As mentioned before, the Pitahaya only blooms at night and wilts by morning. It is caught early morning during a half wilt. Once the flowers have matured, the fruit continues to develop. The difference between the fruit and the bulb is how rotund and larger the fruit becomes. They do look similar since both are green; the differentiating aspect is the “flame” of the dragon fruit here. As the season progresses, the dragon fruit gradually turns from green, to pink, then towards a shade of red best categorized as a balance between pink and scarlet. 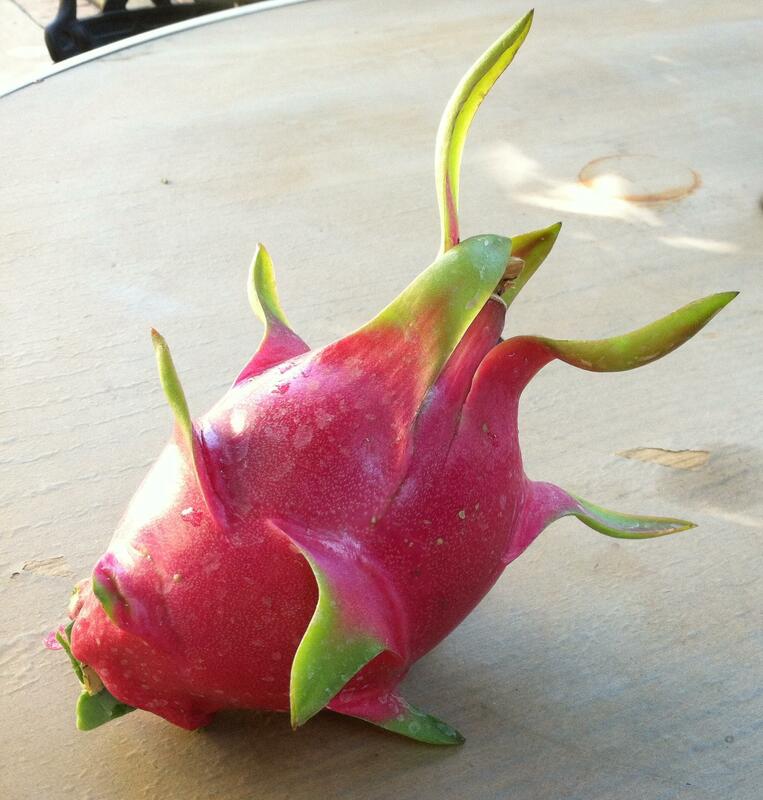 Whether you’re at the local grocer or at a pitahaya grove, the same rules apply for picking a dragon fruit. First of all, make sure there are no brown spots; then inspect the tips of the “flame” or leaves, to make sure they’re not brown and dried out either. The flames, can be green, but if there is green on the fruit, it may still be a few days from its optimal ripeness. You want an even and smooth red throughout the fruit as shown above. It’s quite simple. Take a knife and cut it in half the long way, in the direction of the flames. From there, you can slice it the length of the fruit as shown above, in thirds. Unlike other fruits, such as the pear, or apple, do not eat the exterior skin. You’ll notice the white flesh with little black specks, which are the seeds. It separates quite easily from the red skin and you can peel it like an orange. The flesh is soft, and the flesh is similar to kiwi except it falls apart even easier, more loose. It’s also more wet. The seeds are more evenly dispersed, when compared to the kiwi and the seeds themselves are the same crunchy texture like kiwi seeds. Not as pronounced in sweet or sourness, but it’s a very tamed and controlled sweetness. QooMui says that some people treat it like gatorade when there is no source of water nearby because of how wet and succulent the dragon fruit is. Remember, the dragon fruit is a species of cactus. What recipes have you used with dragon fruit? 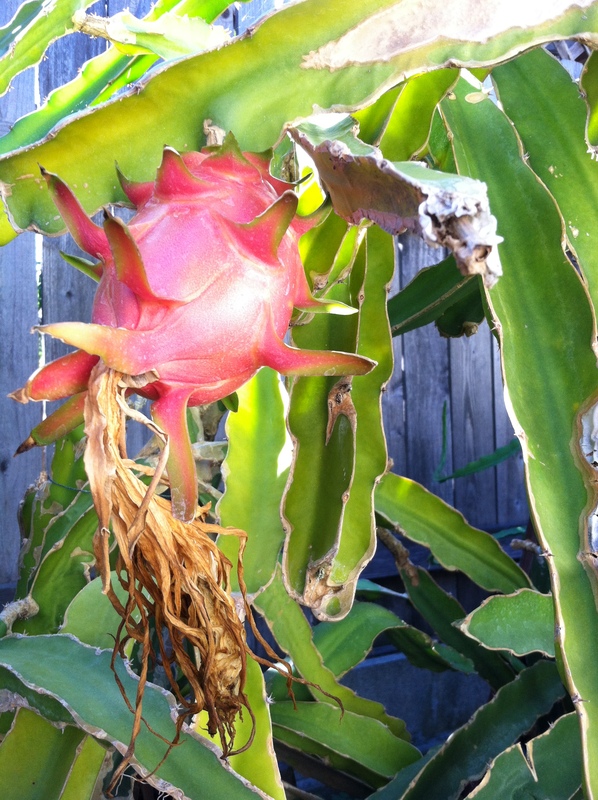 How do you cut a dragon fruit up or how do you tell if a dragon fruit is ripe? Do share in comments below! I usually start at the top and peel the outside skin, almost like peeling a banana. After peeling about half the skin away, I take a spoon and eat directly out of the other half of the skin. 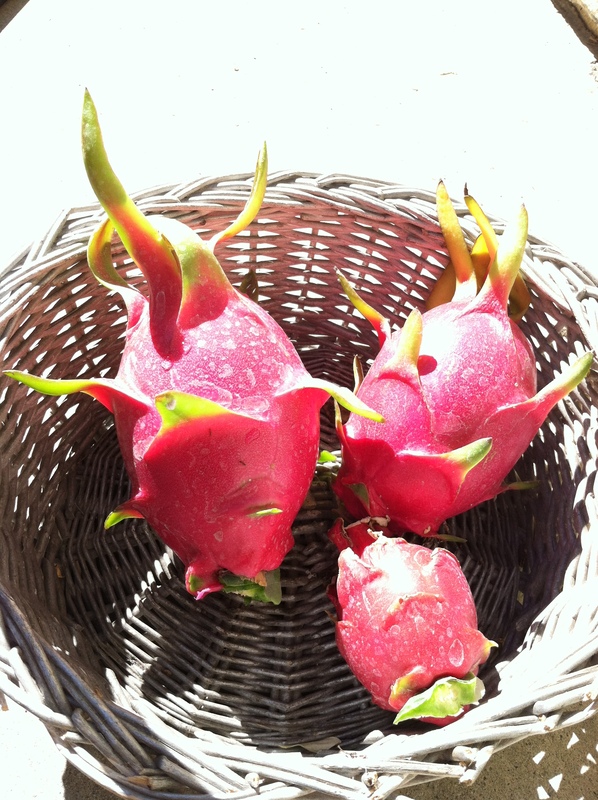 I LOVE dragonfruit…great post! I need to try this next time! Away with the knife. : )Thanks for the suggestion!